Blog -Shanti Life | We are not-for-profit organization promoting entrepreneurship and sustainability. Surendranagar District, in Gujarat – India, has been home to numerous traditional art forms. Artisans – primarily men, work with silk, cotton and wool – conjuring amazing sarees, stoles, shawls and other contemporary dress materials. Primarily, the artisans work on handlooms. Artisans engaged in weaving “single ikkat” silk sarees form a formidable group. There is a large number of artisans who work on cotton – churning out khadi products such as cloth, dress material or mats. A small group of weavers practice the “tangaliya” weave (they have the GI – Geographical Indicator akin to a patent) and have been creating stoles, shawls, and other contemporary dress materials. Raw material is expensive and prices fluctuate. As well, credit access is available but intrest rates are exhorbitant. Normally, the artisans buy the raw material from the local dealer on credit. The dealer charges a high interest rate, while limits the timeframe within which the artisans have to pay for the raw material – with the high interest. The artisans then end up “distress” selling, thereby making very little or no profits. Shanti Life India Foundation has been supporting the artisans and last year, three of them came forward and took loans worth Rs.30,000.00 each ($450) and bought raw material from the market. They have paid back their loans, over the last 12 months. These three artisans benefitted from the low interest credit access and now have motivated other artisans to seek credit access from Shanti Life India Foundation. At Surendranagar, two meetings were held. The new artisans were oriented to the process of seeking credit from Shanti Life India Foundation. Discussions focused on the loan application forms and the terms and conditions laid out in the MoU. 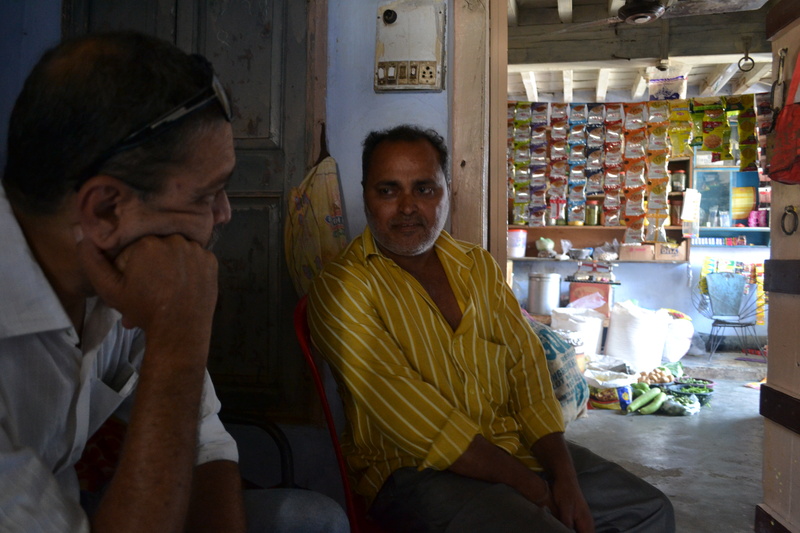 The importance of using the exisiting banking system too was explained – especially in keeping the interest rates low and to help build the credit history of the artisans. This would help them graduate to the bank for future loans. In all, 15 loans were provided to 15 artisans. The forms and the MoUs were signed and stamped. Loan cheques were then handed over to the artisans. The post dated cheques were collected from each loan applicant. Three artisans increased their loan amount to Rs.40,000.00 ($600) (last year it was Rs.30,000.00 – $450) while the rest being new were provided with a base loan of Rs.15,000.00 each ($225) Of the 15, two women artisans came forward while 13 men artisans were provided loans. Shanti Life India Foundation – provided a total of Rs. 2,95,000.00 ($4400) and we hope that this credit access will help the artisans make a better profit. This wuld inmapct the family’s quality of life – especially the women and the children in the artisan’s family. “The times are bad in our village. A lot of young boys in the village are upto no good” says JayaBen. With an anxious look she explains “the young boys trouble, tease and cat call at our girls when they are going out to the fields”. On my recent trip to Bhayala, a small village I realised the odds are stacked up against young adolescent girls; they have to live in a patriarchal society that discriminates against them, they are denied opportunities and they have to live in the fear of sexual assault everyday. JayaBen has three young daughters. It is for their safety that she took a sanitation loan from Shanti Life and built a toilet and a bathroom that is attached to her house. A study from Dasra, an organisation working towards social change, shows that 63 million adolescent girls in India do not have access to private toilet*. Most days they hold their bladder and control their bowel movements. Imagine what they must do when they are menstruating? Majority of the women in rural areas do not have access to clean and safe sanitary products. They use old rags and commercial pads are either difficult to get or expensive for rural women. The lack of a clean or private space in which they can change their menstrual cloths or products often leads to RTIs (Reproductive Tract Infections). Dissolving such taboos becomes even more difficult when most girls start missing school because of their inability to manage menstruation. Menstruation in most areas is meant to invisible and silent and so are the menstruating women. Menstrual hygiene awareness definately does not benefit when information has been derived from old-woman rumours, ignorance and censorship. At Shanti Life we celebrate women who have taken proacative steps to build toilets for themselves and their daughters, like JayaBen. And we recognise that this is the best first step towards achieving good menstrual as well sanitation hygiene. However, building infrastructure needs to be met with education and awareness. Women and girls must understand the significance of good hygiene and the solutions need to respond to the needs of these women rather offering one-size-fits all solutions, like the government free toilets. We are exploring how facilities can be spread through schools. Shanti Life Wins Most Enterprising Charity of the Year! 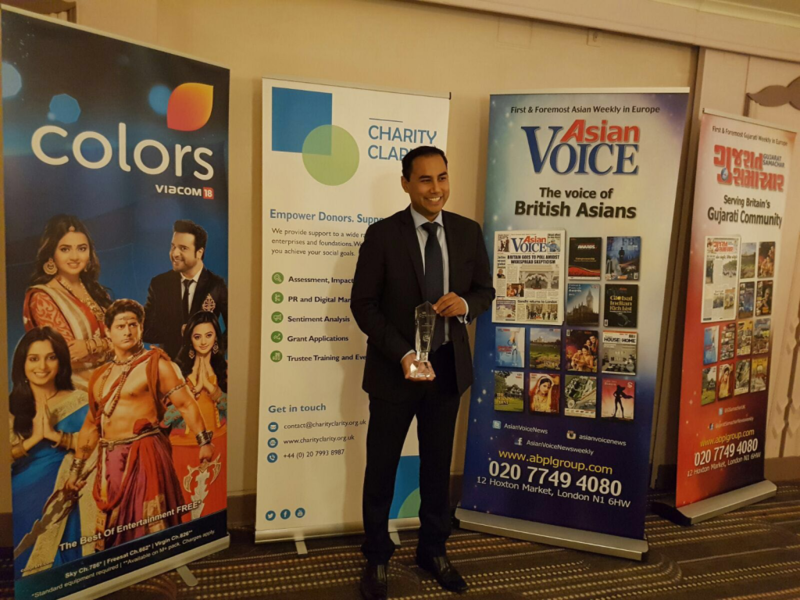 Shanti Life is honoured to win the Most Enterprising Charity by Asian Voice and Charity Clarity. On May 20th, 2016 the who’s who of the Indian Community in the UK and many charities came together in London to celebrate what’s working right in the NGO sector. The judges applied the Charity Clarity rating process to determine which charities are most accessible, transparent and accountable. Shamir Shah Director of Shanti Life received the award and gave a heart felt speech. Shanti Life met those criteria but furthermore was able to raise awareness about our unique model which truly creates sustainable living. What does that mean? It means giving money directly to a beneficiary through a bank account, teaching them how to use checks and providing financial literacy training. It means providing mentoring and working on a case by case basis.Each beneficiary is a person not a client – a term often used in the microfinance world. We will continue to serve our communities and maintain a level of true transparency and accountability. The Spirit of Bavla – Powerful Women! 31 kilometres away from Ahmedabad city is Bavla. It is your typical Indian urban village that is caught between the pull and push of urbanisation, identity and rural life. The people in this village certainly seem to be trying to move on with the times; living in low rise apartments, building toilets, having shopping plaza and wearing jeans! I had the pleasure of meeting three women of this village who have also tried to move with the times. 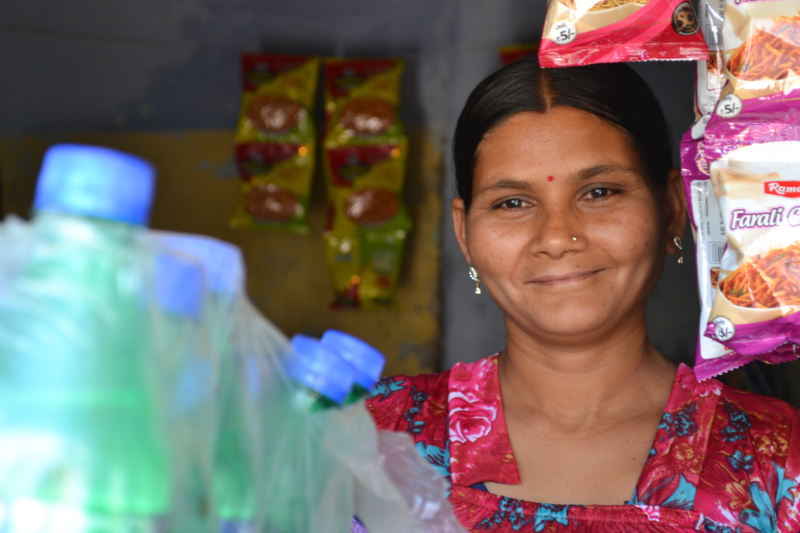 Sunandaben started a business, Sonalben built a toilet and Hassenaben become an entrepreneur. Sunandabenben is a proud owner of a corner store. 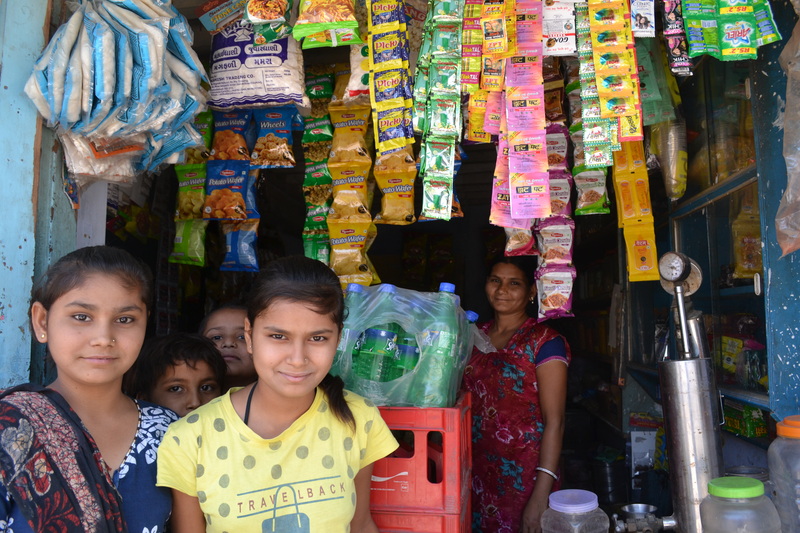 At first her shop was a tiny hatch that sold only non-perishable items and some packaged food such as crisps, chocolates, sweets etc. But now the shop has expanded and nearly occupies half of her house! A low interest loan from ShantiLife has made this possible she explains. The shop now holds grains, groceries, packaged good and non-perishable items. Recently she has been able to store milk, milk products and soft drinks that are kept in the pride of the shop – a refrigerator! Sunandaben’s venture has certainly been successful and she is able to pay her installments from her shop’s profits! Her husband,a soft drink vendor, proudly announced “Sunanada has also got a part-time job now! She and some of the other women from the neighbourhood go to a local facility to make banana chips!”. Sunanda gives a coy smile when she hears her husband acknowledging her accomplishment. The husband and kids look after the shop while she is at her part-time job. I noticed that while the adults were talking the kids without any assistance handled the shop on their own. So I asked the youngest, a boy, what would he like to be when he grows up. He announced “A policeman”. As the siblings giggled the oldest, a girl, said “I want to be be tailor, sew fancy clothes for women” then the other girl said “I am going to be a beautician and work at a salon!”. While the kids were still giggling Sunandaebn whispers “My part time job will pay for all these dreams!”. Sonalben is Sunanadaben’s neighbour. When she heard that Sunanda got a low interest loan she decided to take a loan too so that she can build a toilet. She took a loan of Rs.15,000 which she able to pay back all by herself. Sonalben is a seamstress. She has no bathing area yet but she is extremely happy to have a toilet. Haseenaben is a fierce woman who has recently moved into a 1 bedroom apartment in a newly constructed low rise. 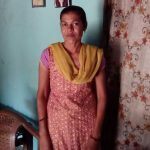 She borrowed Rs.15,000 to purchase two sewing machines. Haseenaben makes beautiful sari laces on her sewing machines that she keeps in shops across Bavla. She is of the most punctual installment re-payer, with a very good understanding of economics. She now wants to apply for a second loan to buy a pick up truck for her husband. “My husband is painters” she explains “He has painted everyone’s house in this building. But he has no vehicle to carry all the paint” says she. “So I’d like for him to have a pick-up truck”. Hassenaben’s success borrowing and repaying is recommendable and so is her confidence to borrow money again and this time for her husband! The empowerment I witnessed this week was support orientated and it started from confidence these women inspired within themselves. 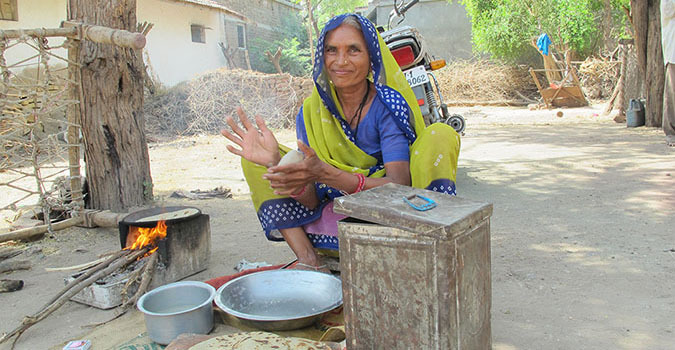 Women such as SunandaBen feel confident when supported by their equal halves and even children. It is empowerment when women like SonalBen are able to build a toilet because she wanted one and pay for it by herself. Women like HaseenaBen are already empowered when they are able, and choose to help their husbands out. Until next time. More stories from Bavla to follow soon. 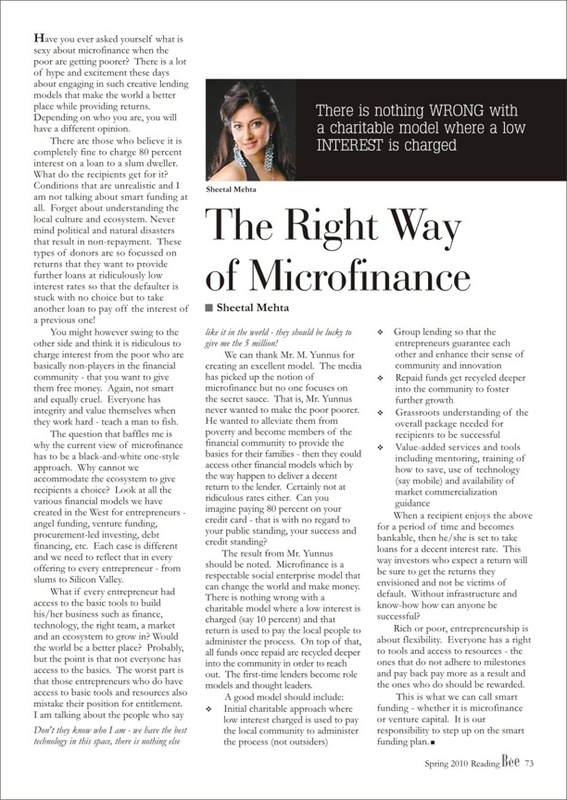 Its been way too long since I posted on our blog because we have been super busy on the ground in the field implementing our amazing microfinance model. Yes our model really is amazing. Why? Because we provide meaningful loans amounts ($100-$300). Our interest rates are amongst the lowest in the industry. If you look at Kiva, the average interest rate charged to poor entrepreneurs (by Kiva partners) is approximately 34% – and as high as 64%. Our interest is between 10% – 12%. And upon repayment all funds are recycled! Oh and we monitor social impact too. We just opened an office in Ahmedabad. Our CEO who brings over 30 years of social work expertise is pleased to leave his home office. We also obtained FCRA status which is a long and painstaking process. This status means we can now give funds directly to the beneficiaries instead of working with 3rd party NGOs who often fail in reporting, aren’t transparent and dont always follow through. 1. 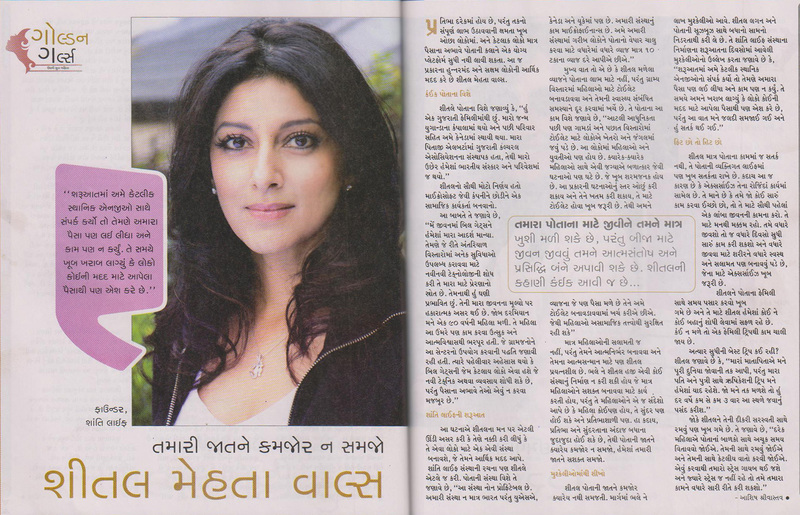 Tell us about yourself and the main events which led to formation of Shanti Life.